This is one of the first recipes I learned as a kid. Whenever my family grills, we like to grill lots of vegetables alongside the meat or fish we’re having. Grilling the vegetables brings out the sweetness. 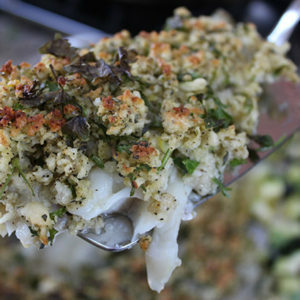 You can use whatever vegetables you have for this recipe, and I change it up sometimes. 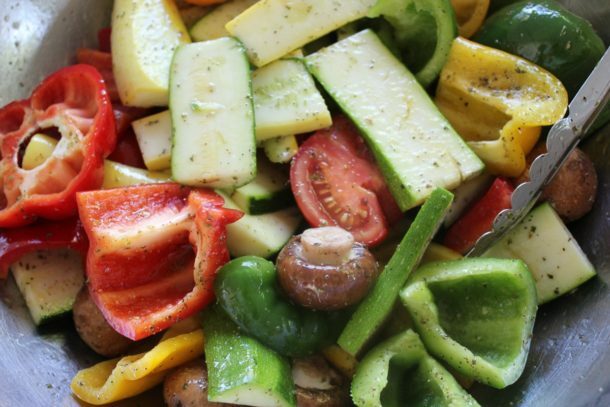 My favorite combo though is different colored bell peppers, zucchini, summer squash, mushrooms, and tomatoes. This is a good variety because some people may not like one or two of the vegetables, but you can almost guarantee they like at least one of them. In order to grill these correctly, you’ll need a nice hot grill. If the grill isn’t hot enough, you won’t get that beautiful black char that is essential to this recipe. Another major tip for this recipe is to not flip the vegetables more than two or three times. If you keep flipping them, they will never get the grill marks you want. My preference for these is to cook the vegetables all the way through until they are soft, with no bite or crunch to them. I think the sweetness of the peppers really comes out when you grill them all the way through. The amounts in this recipe will fill up a normal sized grill about twice. 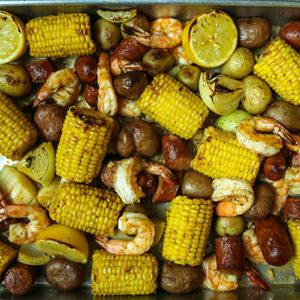 If you are grilling meat or seafood, do the vegetables first because they taste even better if they sit a little while. You want the meat or seafood to be hot when you eat it, but the vegetables are great at room temp. 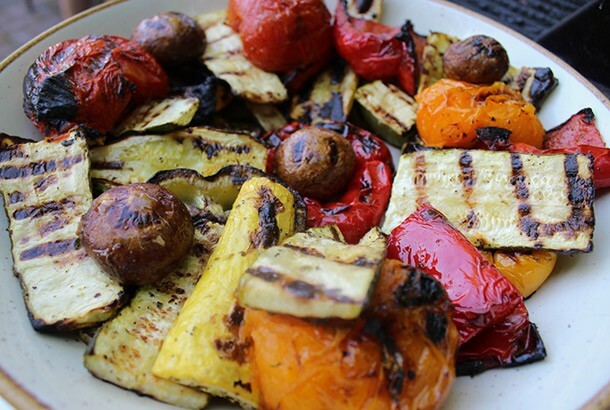 Besides just eating these grilled vegetables as a side, I like to use them in a few other ways. One is to make a sandwich with these vegetables, toasted bread, and your favorite melty cheese. Another way is to put these in a wrap with your favorite melty cheese. Lastly, adding these on top of a salad is a great addition to almost any salad. I’ve been making these for years so I would love to hear your feedback. Please rate and leave a comment! Wash all of the vegetables well. Cut the peppers in fourths. Put in a big bowl. Slice the zucchini and squash in half. Make 1/4 inch thick rectangular pieces. Don't cut them too thin or you won't get that meaty texture. Also don't cut them too thick or they will take much longer to grill than the rest of the vegetables. Add to big bowl. Using a damp paper towel, remove the dirt on the mushrooms and add them to the bowl, whole. Cut the tomatoes in half and add to the bowl. 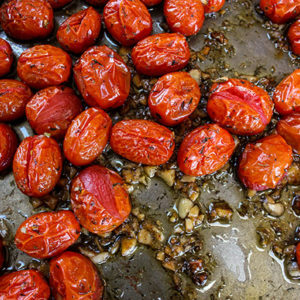 Pour on the extra virgin olive oil, red wine vinegar, and dried oregano. Season with a generous amount of salt and pepper. Toss well and let sit for at least 30 minutes to marinate. Once the grill is hot, put each vegetable on individually. Don't pour the entire bowl onto the grill because it will flame up from the olive oil, and it's a hassle to move them around the grill. 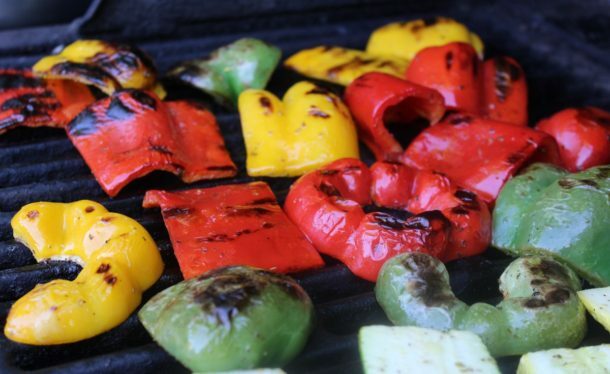 You may also lose some veggies through the grill grate if you do it this way. After about 7 minutes, flip and grill for another 7 minutes, or until the vegetables are charred and cooked all the way through. Transfer the vegetables to a serving platter and pour on some of the marinade that they were in previously.